This attractive hard-sided art case is constructed of a wood core laminated with leather grain vinyl on the outside and cloth grain on the inside. The handle is comfortable and the latches strong and keyed. The bottom folds at both seams in order to lay flat and completely open. Fits artwork up to 14"x18". 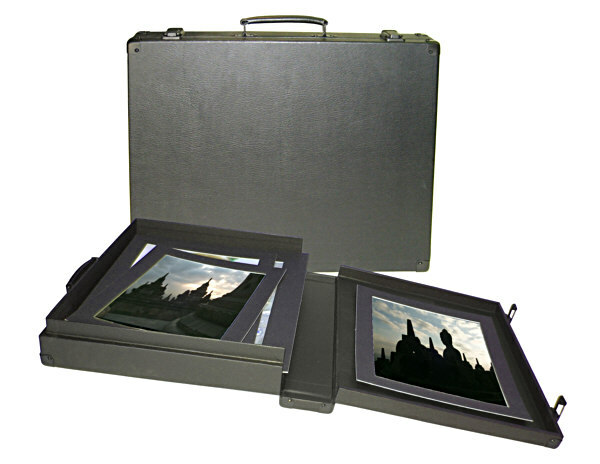 This attractive hard-sided art case is constructed of a wood core laminated with leather grain vinyl on the outside and cloth grain on the inside. The handle is comfortable and the latches strong and keyed. The bottom folds at both seams in order to lay flat and completely open. Fits artwork up to 11"x14". This attractive hard-sided art case is constructed of a wood core laminated with leather grain vinyl on the outside and cloth grain on the inside. The handle is comfortable and the latches strong and keyed. The bottom folds at both seams in order to lay flat and completely open. Fits artwork up to 16"x20". This attractive hard-sided art case is constructed of a wood core laminated with leather grain vinyl on the outside and cloth grain on the inside. The handle is comfortable and the latches strong and keyed. The bottom folds at both seams in order to lay flat and completely open. Fits artwork up to 20"x26".